Apple finally got on board the wireless charging train. Here's what to look for when picking out a charger for your iPhone 8, X, XS, or XR. 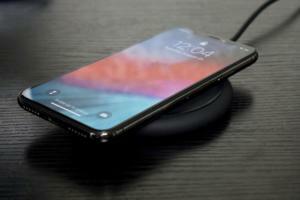 Beginning with the iPhone 8 and iPhone X, Apple has finally added wireless charging to the iPhone. That continues with the iPhone XS and iPhone XR. For years, many Android users have had the ability to simply plop their phone on a pad to juice it up, but to do that with an iPhone used to require a special (and bulky) case. 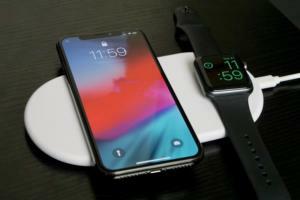 Update 4/01/19: Apple has discontinued its AirPower wireless charging mat. On March 29, 2019, Apple officially acknowledged that AirPower will never see the light of day. The wireless charging mat was announced in the fall of 2017 and was expected to be released early in 2018. It was an attempt to do something no other wireless charging pad can: charge up to three devices on a single pad of different shapes and sizes. Apple simply couldn't get it to work reliably. Now, your only option to use the wireless charging capability of your iPhone or the AirPods Wireless Charging Case is to buy a third-party Qi-compatible product, like the ones in this guide. 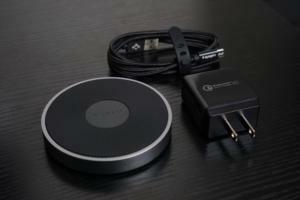 The Charge Stream Pad+ is a substantial upgrade over Mophie's previous charging pad offering, the Wireless Charging Base. At a retail price of about $60, it's a little on the expensive side, but it's a better buy than the Wireless Charging Base was. 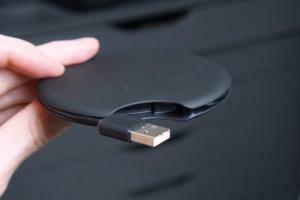 While the Wireless Charging Base used a proprietary power adapter that connected to the charge pad via a small barrel connector, the Charge Stream Pad+ uses a microUSB cable and adapter. The connector for it on the pad is deeply recessed, which makes it hard to use other microUSB cables with it, but at least you can use the adapter and cable to charge other microUSB devices (like digital cameras or Android phones). Charge performance is improved, too. It tops out at 10 watts on supported Android phones, though the iPhone 8, 8 Plus, and X are limited to 7.5 watts (that's an Apple thing, not a Mophie thing). The pad itself is a good size with a large sweet spot, so it's easy to plop down your phone without worrying about getting it perfectly centered. The hefty weight and rubberized finish prevents the pad from sliding around on your desk or your iPhone from sliding on the pad. It can easily charge through modest iPhone cases, and the small status light is subtle enough not to distract you in a dark bedroom. Oh, and it's now available in white or black, so you can more easily match your furniture or iPhone. 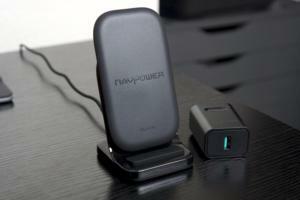 RAVPower's latest charging stand is a nice improvement over its previous models. It's got a sleek, unassuming design with a nice big ruberized pad to rest your phone on, and two coils so your iPhone will charge in either portrait or landscape orientation. The angle is steep, almost entirely upright, which made us worry that Face ID wouldn't work well. In testing, Face ID worked just as well as with most other wireless charging stands. This new charger supports 5W and 10W modes on Android phones, and Apple's own 7.5W standard on the latest iPhones, too. RAVPower has impreoved the cooling to keep the charging coils from getting too warm, which can slow down charging performance. The braided micro USB cable is a nice touch, but it's only about four feet long. We had trouble making it reach the socket with the stand sitting up on a desk. As with so many other wireless charging stands, it can be a little wobbly if you try to use your phone with too much force. Making the base just a little bit longer in back would have made it less prone to tilting. At $50 it seems a little expensive, but that cost is offset by the 24W USB-A power adapter included in the box. It's not perfect, but it's a great choice for the price. 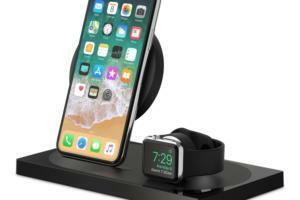 If you need to charge both your iPhone and Apple Watch, you can do worse than Belkin's Boost Up Special Edition stand. Available in black or white, it's got an elegant design with a nice mix of matte and glossy finish. You can't charge your phone in landscape orientation—the charge pad is too high up, and larger iPhones would run into the Watch charger. And unfortunately, the middle of the Apple Watch charger is white (even if you have the black stand), but there's no officilaly supported way around that. Phone placement is easy and charging rate is solid. The stand supports 7.5W charigng for your iPhone and 5 watts for your Watch, both simultaneously. There's a little USB-A port around the back if you need to charge another device, too. The Watch charger is arranged vertically, perfect for those with loop-style bands that prevent you from laying your Apple Watch down flat. The power brick supplies enough juice to do all of this at once, but it's otherwise sort of annoying. 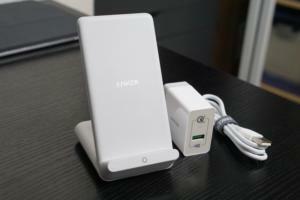 It's exceptionally large for a wireless charger and will easily cover three plugs on your power strip. It connects to the stand via a barrel connector rather than USB-C, so you can't really use it for any other devices. Still, this is the kind of thing you plug in once and leave on your bedside table or desk, not something you'll move around. If only the price wasn't so high. $160 is three times the price of other high-quality wireless phone charging stands, and sticking a nice little Apple Watch charger on the side isn't enough to make that price differential worth it. If this goes on sale, it will be a great pick for your nightstand. 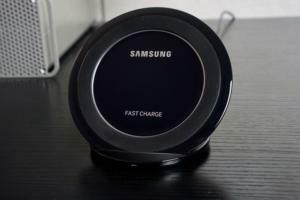 The Boost Up wireless charging stand looks like something out of a sci-fi series, and not in a good way. 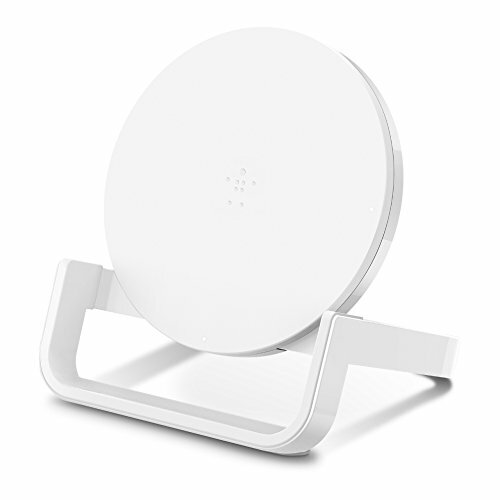 It’s a big circular disc propped up on a large and odd-looking stand that kind of looks like a retro-future easel. To be frank, it’s a bit of an eyesore. Power is supplied by a bulky AC adapter permenatly attached to a power cord, ending in a barrel connector, which will be a pain to replace if you lose it and can’t be used for any of your other gadgets. Haven’t we all learned that microUSB or USB-C is the way to go here? There’s no denying it works well, though. The generous width and curved corners of the bottom make it really easy to drop your iPhone on the stand without getting the alignment off, and the way the phone holder’s sides cut up a couple inches makes it really great for landscape orientation. It also maintains a strong charging connection even through most cases, and it’s very stable—poking and prodding your phone while it’s on the charger won’t cause it to tip or slide around. It’s also pretty expensive, at a retail price of $69.99 (you can often find it online for about $15 less). Anker’s new PowerWave products greatly improve quality over its older wireless chargers, but they bump up the price to match. The new stand looks good, as long as you’re okay with the white color. A small blue charge indicator on the front is subtle enough to use on your bedside table. The angle is steep enough to make it suitable for unlocking your iPhone X with Face ID while your phone is resting on your desk. Anker includes a Quick Charge 3.0 compatible power adapter and a matching white microUSB cable, but the cable is way too short. Anker’s spec sheet says it’s three feet long, already a little on the short side, and we measured it at 34 inches. The charger supports 7.5W charging on Apple devices and the 10W fast charge mode on the latest Samsung flagship phones. The power coils inside cover the entire back of the stand, so we had no trouble charging our iPhones in either portrait or landscape orientation. A little cooling fan blows air out a vent in the rear to keep the charge coils cool, which keeps the charge rate from slowing down. If it’s especially quiet and you put your ear up next to it, you can hear the gentle whirring sound. The extended delay of Apple's AirPower charging pad has left plenty of time for knock-offs to claim a stake. 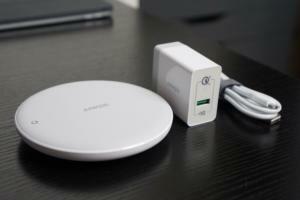 Funxim successfully crowdfunded its effort on Kickstarter, and now it's here. For what it is, it's not bad. This is a $32 pad that can wirelessly charge your iPhone and Apple Watch at the same time. And it works well, even charging our test iPhone through a fairly substantial plastic case. 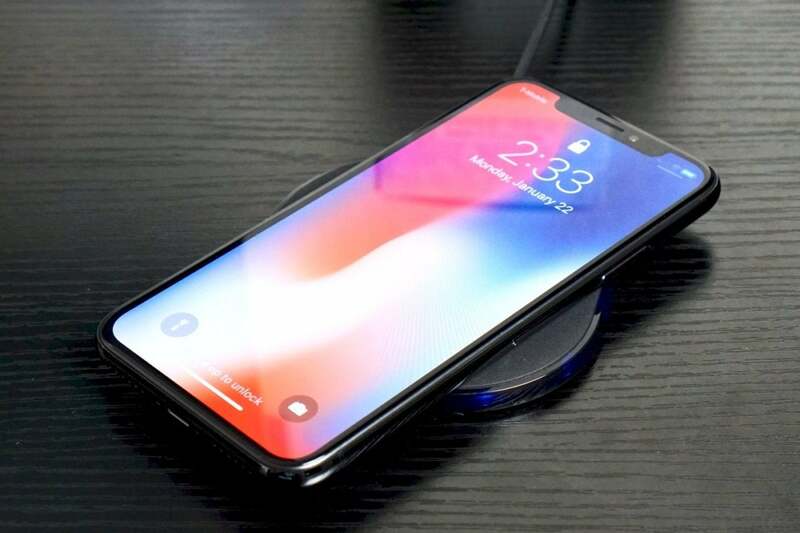 Because it supports the Qi standard, like all iPhone-supporting wireless charging pads, it will also charge most Android phones with wireless charging. Naturally, the price comes with a set of compromises. The pad has a large circular cutout to one side, into which you install your official Apple Watch charger. You'll open up the back to loop around the cable and plug the USB end into a USB-A port hidden in the base. What's more, the pad itself is made of a hard, smooth plastic that encourages the phone to slide around (especially without a case). When my iPhone X vibrated while on the pad, it slid around as if pushed by a ghost. What's more, I had to be fairly precise with my placement in order for the phone to charge. While the pad is oblong, the charging area for the phone is only right in the center; place it too far to the side and it won't charge. And of course, your Apple Watch has to go on the Watch charger you supply. Kickstarter backers may have gotten a free Quick Charge 3.0 compatible power adapter and micro-USB cable together with their purchase, which makes this a pretty good deal. But the need to supply your own Apple Watch cable (at least $29 from Apple), the precise placement required, and the too-slick design make it hard to otherwise recommend. That’s sort of a shame, too, because the price is the only thing giving me pause. We like the ring of blue LEDs that “breathe” for about 10 seconds before turning off, to let you know a charging connection has been made. We like the size. We like the grippy top that your phone won’t slide around on. 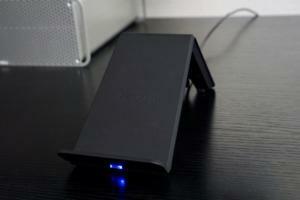 If you find this on sale, or have an extra Quick Charge USB adapter lying around, it’s a great buy. We're not entirely sure who this product is for, exactly. 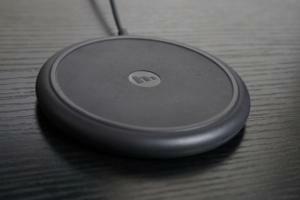 It’s a wireless charging pad with an integrated USB cable that tucks away inside. That’s sort of neat and makes it a little more portable, but you still need something to plug the USB plug into. If you’re on the go, you can plug it into your laptop or something like that, but do you really need a wireless charger for that? 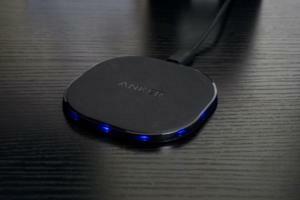 The Qimini site proclaims it to be, “The world's thinnest wireless charger plate to date,” but the Anker Powerport Wireless 10 is definitely thinner. 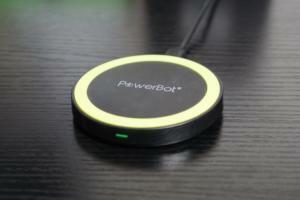 It sells for $59.95, without a power adapter, which easily twice what it’s worth. 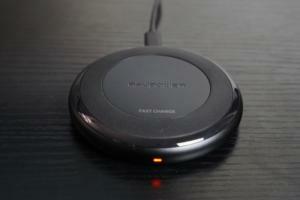 Oh, and it maxes out at 5W output, so it’s one of the slower wireless chargers out there. This stand is a good deal at around $40. It supports fast charging—both the iPhone 7.5-watt limit and faster speeds for Samsung’s phones—and it comes with a micro USB adapter powerful enough to enable it. There’s even a little fan inside that keeps the charging coils cool. Don’t worry, you can’t hear it unless you really strain in a very quiet room. 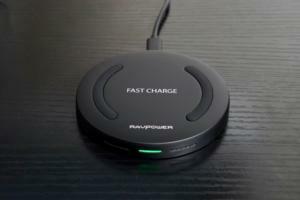 Not to be confused with the other, less-expensive “Fast Wireless Charger" by RAVPower, this other “Fast Wireless Charger” includes a Quick Charge 3.0 compatible adapter (up to 24 watts on supported Android phones) and has an entirely different design. Despite the higher price, it’s a better buy. The new pad is a rather plain large off-white circle. If that aesthetic goes with your desk or bedside table, that’s great, but we can’t help but wish for a black version. There’s a small blue circle charge indicator on top—we’re not a fan of the location, but the glow is dim enough not to be distracting in a dark room. The charging “sweet spot” is large enough that you don’t have to be too precise about how you place your phone down on the pad. Anker includes a Quick Charge 3.0 compatible power adapter and a matching white microUSB cable, but the cable is way too short. Anker’s spec sheet says it’s three feet long (we would hope for five or six), and we measured it at 34 inches. 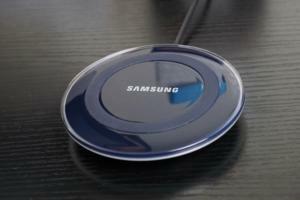 The pad supports 7.5W charging on Apple devices and the 10W fast charge mode on the latest Samsung flagship phones. Anker’s PowerWave products feature cooling fans to keep the charge coils from getting too hot, which can degrade charging speed. If you listen closely in a quiet room, you can hear the little fan inside whirring away. For the price, we would hope for a longer microUSB cable and sturdier construction. The PowerWave 7.5 pad feels a little lightweight and plastic-y, more than the PowerWave Stand, and it’s too easy to accidentally slide around your desk as a result. 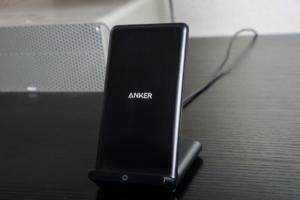 Anker needs to give it a little more heft to help keep it in place. 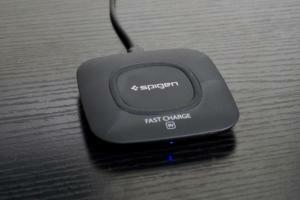 Spigen’s new F306W charging pad is a nice improvement over its old F301W model. The design is much improved, with a sturdier and heavier metallic frame that won’t move around on your desk or bedside table. The charging indicator light is small, forward-facing, and dim enough not to be a distracting next to your bed in a dark room. It’s got a fairly broad “sweet spot” for charging, so you don’t have to fuss with placing your phone just-so to get a connection. It comes with a Qualcomm Quick Charge 3.0 power adapter and a nice braided micro USB cable. It supports Apple’s faster 7.5W charging mode, and if you’ve got a newer Samsung flagship phone you get 10W fast charging. In fact, Spigen says the pad supports up to 15W wireless charging, and while current phones don’t go that high, it’s a bit of future-proofing that may come in handy one day. Heat dissipation is pretty good, too, so the charge rate shouldn't slow down over time. You don’t get something for nothing, though. The F306W, while a much nicer product, is twice the price of the F301W. Unless your plug is really close to where you need to put the pad, you’ll have to dig up a longer microUSB cable, too. At just over three feet long, the cable included here is just short enough to be frustrating. It's a shame, because the price and performance are fine. All it would take a slightly different shape to the plastic mold and Spigen would have a terrific product. Are you interested in a charger you don’t see listed here? That’s not surprising—while we try to cover the most popular brands, there are literally hundreds of wireless chargers on the market. We can still help make sure you get a product you're happy with, though. 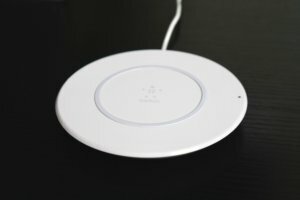 The next page contains some helpful general advice to consider when deciding which wireless charger to buy.